As forecast the wind was up for the race back but still North Easterly so the prospect of a beat all the way. Went for full main and No. 3 but had a minor panic coming up to the start as the halyard came off while hoisting the No. 3 so had to go to the second halyard. As it turned out we did a great start just inside the Wreck buoy and headed offshore on a single tack to Needles Fairway. Some boats tacked inshore but it did not seem to pay as we came into North Head in a reasonable position on the fleet. The wind eased off a bit as we beat up the Solent on the tide and we ended up a little under powered which could account for Raffles and Too Frank getting ahead of us. 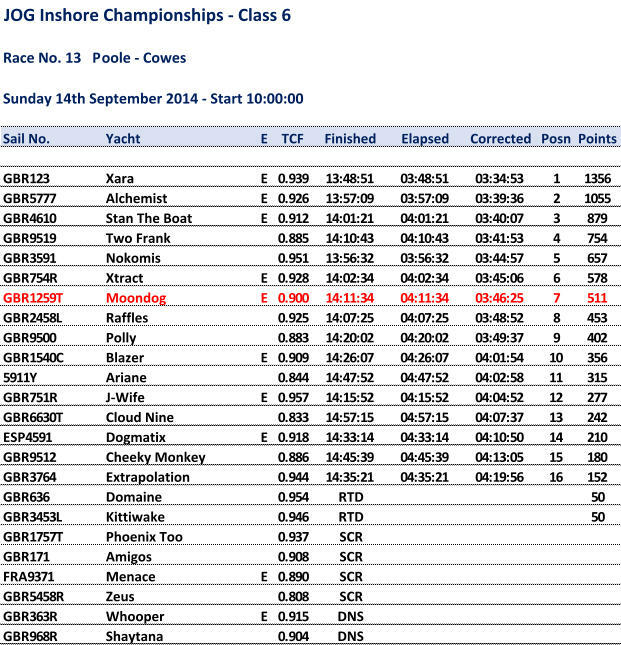 Not too bad a result for a beat with 7th overall and ahead of Raffles, Blazer and Polly.